Getting a new job can be exciting. First off, it's a new job so you're not at your old job anymore or you finally have a job now. Then you also usually have better pay or benefits, new potential friends (or enemies), a new boss, a new place to go, etc. A new job opportunity can be great. One summer, I was in desperate need of a job and I was fortunate enough to get one. It wasn't the most glamorous job, but I was pumped to get started. 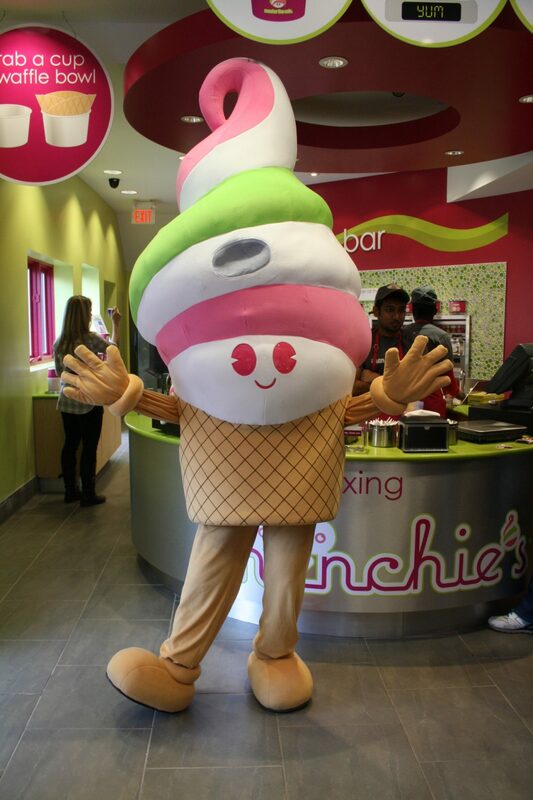 I had accepted a part-time job at Menchie's Frozen Yogurt as the mascot Menchie (if you have time, check out the costume I wore). I know. You probably can't believe I was excited to start this job, but I was! I had always dreamed of working at Walt Disney World as a character so this was as close as I could get. Needless to say, the Georgia summer in a non-AC regulated costume was tough. It was hot. The days were long. I sweated...a lot. I could have easily given up or worked with a bad attitude. But I didn't. I tried to do my best and represent the Menchie name well. Shouldn't we as followers of Jesus do the same? Shouldn't we build each other up? Shouldn't we stay true to the faith? Too many times, we are overcome by our culture and we lose sight of our first love. We stray from Jesus and His Church. We don't go to church. We don't encourage each other. We don't pray. And in fact, our lives begin to look like any other person. So don't stray. You belong here. You belong to Jesus. Remember who you are in Him. Draw near to God during tough times, during your struggles, during your pain. Lift one another up. Love one another. Stay faithful. Keep fighting the good fight. Don't let the heat roast you. Prayer: Jesus thank you for who you are. Thank you for who I am. I pray I draw close to you each and every day. I love you. Amen. Then the Lord said to Moses: “Set up the tabernacle, the tent of meeting, on the first day of the first month. Place the ark of the covenant law in it and shield the ark with the curtain. Bring in the table and set out what belongs on it. Then bring in the lampstand and set up its lamps. Place the gold altar of incense in front of the ark of the covenant law and put the curtain at the entrance to the tabernacle. “Place the altar of burnt offering in front of the entrance to the tabernacle, the tent of meeting; place the basin between the tent of meeting and the altar and put water in it. Set up the courtyard around it and put the curtain at the entrance to the courtyard. “Take the anointing oil and anoint the tabernacle and everything in it; consecrate it and all its furnishings, and it will be holy. Then anoint the altar of burnt offering and all its utensils; consecrate the altar, and it will be most holy. Anoint the basin and its stand and consecrate them.